Coat: Topshop. Sweater: Rag & Bone (old but my serious FAVORITE). Shoes: Golden Goose. Bag: Topshop (on sale). Earrings: Lele Sadoughi. Pants: Topshop. Shop all my pearl favorites below! LOVING all of the pearl details! just got some pearl barrettes and I think I’ll be stocking up on more this season! Pearls are so lovely, they always gives an impression of class and elegance and timeless beautiful look! Loving the winter whites! Especially all the pearl embellishments. My favorite outfit so far! Definitely my style from head to toe! Love this look with the white pearls! 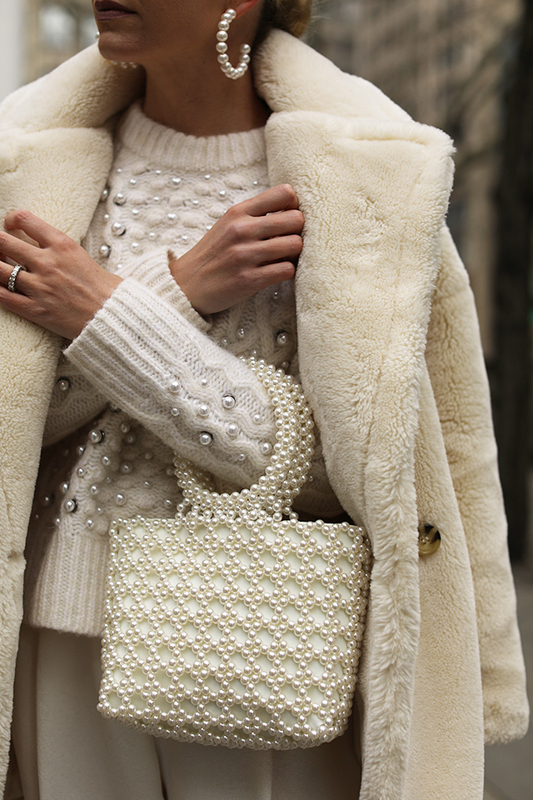 Love your pearls sweater! It’s so beautiful! Pearls are so feminine, I adore them. Your sweater is very sweet and fits your white foux fur. What a gorgeous bag! I’m loving pearls right now! Love the all cream and pearls. Looks so comfortable and classy. This all white outfit is GORGEOUS! Love the pearl embellishment! Love the look. And with the sneakers it s perfect! I have been in love with these types of bags! Thank you for introducing me to another cute one!! I love all these pearl details! That bag is beautiful. This is such a beautiful winter white outfit. 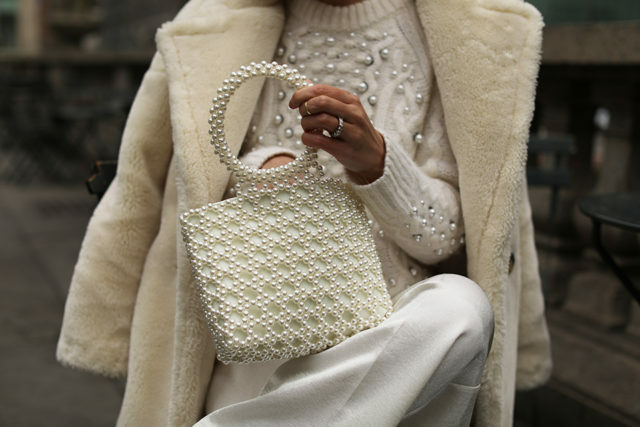 I especially love the pearl sweater. It’s so pretty. this look is absolutely fantastic! I especially love the details of your hair clips. Tey are so so posh. This outfit looks so luxury! Oh wow! Every pieces in this look is so opulent. You look like a piece of art! Oh my gosh, I am absolutely loving this all-white look! obsessed with this entire look! Straight from the ocean depth!! I absolutely adore this outfit its so simple but stylish!